AERIAL REPAIRS SOUTH BRENT, South Devon - Same Day Service, Call Today! Thanks for finding my site. 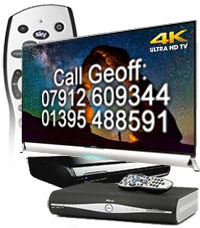 If you live in South Brent and have any problem with your aerial, TV reception, TV mounting, Freesat or require any of the services listed below, then then let me sort it – call today! I offer same day Aerial repairs in South Brent, South Devon. Whether aerial installations South Brent or aerial repairs in South Devon, no job too big or small! Same day service in South Brent! Customer satisfaction is our priority, both in cost and quality. Our aim is to give a same day Aerial service in South Brent, South Devon that gets it right first time. We want our South Brent customers to use our business time and time again, and to recommend us to their friends and colleagues in South Brent and surrounding areas. All work is free quoted and explained to you in South Brent before we proceed. The customer knows the cost before the Services is started and therefore can choose if they want to go ahead with the project or not. Where there are different options available all will be fully explained prior to the commencement of work.